The Tarantula nebula is in one of the most incredible field of the entire sky. Tens of nebulae are present in this 1°x1.5° field, so that the observation through a large Dobson is unforgettable: the eyepiece fov can be moved around and many small tarantulas come into view. 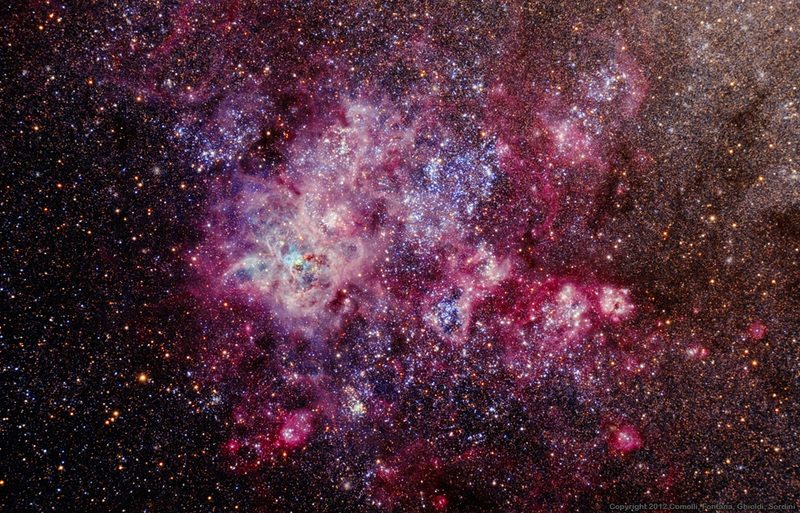 Even more incredible is noting that this nebula is NOT part of our galaxy, but of the Large Magellanic Cloud (LMC, 160000 l.y. distance), whose stars are visible in the upper-right corner. The main color is purple-red (Hydrogen), but the central regions are green colored (Oxigen). Many big and hot stars are present all around, the can be recognized by their blue color. Notes This image is a collaborative effort of the Namibia 2011 expedition. Processing: Lorenzo Comolli. Images by: Lorenzo Comolli, Luigi Fontana, Giosuè Ghioldi, Emmanuele Sordini. HTML Editing and Publishing by Lorenzo Comolli. Email me at comolli@libero.it.